Ralph Stage was born on April 15, 1930, in Newark, Ohio. He enlisted in the U.S. Army on April 28, 1948, and served as an infantryman during the Korean War from June 1950 to July 1951. Sgt Stage served as an infantryman in Europe from February 1952 to July 1955, and then served as an infantryman with Headquarters Company, 418th Ordnance Battalion with the U.S. Army Reserve at Marion, Ohio, from August 1955 to April 1956. His next assignment was as First Sergeant of Company B, 332nd Infantry Regiment at Newark, Ohio, from April 1956 to August 1957, and then as First Sergeant of Company B, Army Reserve Training Unit at Sikeston, Missouri, from August 1957 to May 1958. 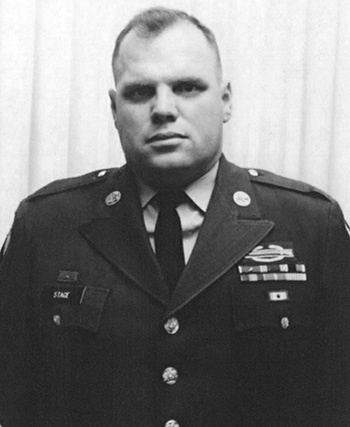 SFC Stage served as a tank gunner with the 550th Tank Company at Fort Campbell, Kentucky, from May to September 1958, followed by service as a tank commander with Company C, 2nd Heavy Tank Battalion of the 33rd Armored Regiment in West Germany from September 1958 to September 1961. He served as a security section leader and operations sergeant with Company D, 66th Armored Regiment at Fort Campbell from September 1961 to July 1963, and then served as a patrol supervisor with the 553rd Military Police Company at Fort Campbell from July 1963 to February 1964. 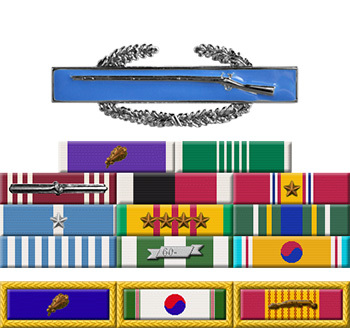 SFC Stage's next assignment was as an operations sergeant with the 7th Military Police Company in South Korea from February 1964 to February 1965, followed by service as an operations sergeant with the 5th Military Police Company at Fort Carson, Colorado, from March to November 1965. He attended Army Recruiting School at Fort Benjamin Harrison, Indiana, from November to December 1965, and then served as an Army field recruiter in St. Louis, Missouri, from December 1965 to May 1968. His next assignment was as an admin specialist with the 4th Transportation Command in South Vietnam from June 1968 to May 1969, followed by service as a career counselor and then as a personnel sergeant at Ireland Army Hospital at Fort Knox, Kentucky, from July 1969 until his retirement from the Army on February 17, 1971. Ralph Stage died on March 19, 2002, and was buried at the Maple Grove Cemetery in Lancaster, Ohio.